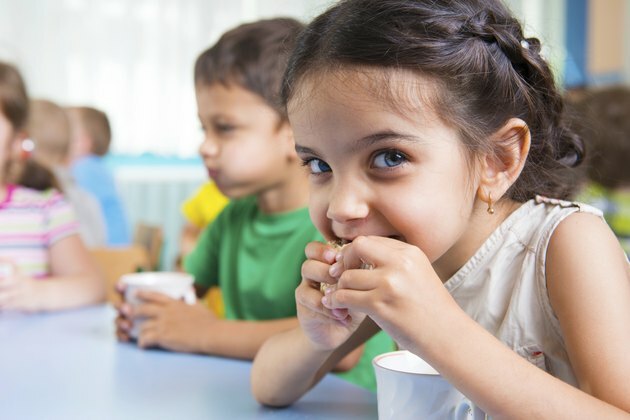 A balanced diet can help your 3-year-old achieve optimal growth and development and create healthy eating habits that reduce the risk for chronic diseases and obesity. The Centers for Disease Control and Prevention growth chart provides a guideline to help monitor your child’s growth in weight and height in relation to age. The Academy of Nutrition and Dietetics recommends that children who are 3 years old should get 1,000 calories per day. According to the Academy of Nutrition and Dietetics, 45 percent to 65 percent of these calories should come from carbohydrates, 30 percent to 40 percent of total daily calories should come from fat and the remaining 5 percent to 20 percent of total calories should come from protein. To have a balanced, healthy diet, your child’s calories should come from a variety of food. The Academy of Nutrition and Dietetics has specific recommendations for the serving size your little one should get each day. Your 3-year-old needs 2 ounces of protein foods, 2 cups of dairy, 1 cup of fruit, 1 cup of vegetables and 3 ounces of grains every day. Can Certain Foods Make Your Body Grow Faster?